CLINTON, N.J. (July 31, 2018) - It was a record-setting year for the Unity Bank annual fundraiser for Family Promise of Hunterdon County and Family Promise of Warren County with $8,500 raised at the bank's recent 12th Annual Cruisin' Bob's Classic Car Show. The funds were raised through sponsorships, food sales and registration fees to compete in the classic car competition with Unity Bank underwriting expenses. "We could not have asked for a better response from the community, car owners and our sponsors," said Rosemary Fellner, Unity Bank Senior Vice President/Chief Marketing Officer. "I am proud of our employees who put in extra effort to make the show a success. Most importantly, these two vital community service organizations receive much needed funds and have a chance to share their message." Family Promise of Hunterdon County and Family Promise of Warren County provide services to both help overcome and prevent homelessness through the Interfaith Hospitality Network (IHN) - a network of congregations and volunteers who provide overnight/weekend shelter, home-cooked meals, and companionship to families who enter the program. Comprehensive case management, licensed counseling services and a donation program are also available. Sponsors of the event included: Shift4 Payments LLC; VanDoren Oil Company; True & Associates; Stowaway Self Storage; Fiddler's Elbow Country Club; Muller Powersports; Old Mountain Studio; Gus & Bucky's Car Washes; KBS Car Care; Lynn Blessing McDougall, Esq. ; ShopRite; The Farmhouse at the Grand Colonial; OK4WD; Family of Bob Rittelman; MSI Plumbing, Inc.; Tony O'Reilly & Associates; Maresco International; Bridgewater Collision Repair; Flemington Car and Truck Country; Red Mill Museum Village; Eleanor Connell School of Dance; and Berkshire Hathaway of Clinton. The following classic car owners won cash prizes in a wide range of categories including: Best Custom Paint, Richard Simon, 1937 Ford Conflict Convertible; Best Custom Interior, Addie Lowrie, 1955 Chevrolet Bel Air Convertible; Chauffeur's Choice, Jerry & Kiki Mehner, 1935 Auburn 851 SC Phaeton; Rattiest Rat Rod, Bruce Cenicola, 1934 Chevrolet Coupe; Best Car for Lenny and Squiggy, Norman Smith, 1949 Crosley 2 Door Sedan; Best Truck, Joseph Berry, 2005 Dodge Ram 1500 Daytona; Most Likely to Get a Speeding Ticket In, Raymond Cash, 2017 Dodge Viper APR; Coolest Motorcycle, Muller Auto Sports, Kawasaki ZX-6R; Best Get Away Car, Jesse D'Ambrosio, 2013 Dodge Charger SRT8; Best for Family Vacation, Greg Strysky, 1971 Volkswagen Westfalia Weekender; Best Gangster Car, Pat Burdi, 1940 Ford Deluxe Coupe; Best First Date Car, Gary Morris, 2017 Dodge Charger Daytona 392; James Bond's Car of Choice, John Cubanowitz, 2018 Lamborghini Hurricane Spyder; Oldest Car, Howard Blanding, 1927 Ford T-Coupe; Youngest Car, Anthony Esposito, 2018 Jeep Overland; Most Miles Travelled, Ted Sanseverino, 1979 Cadillac Coupe Deville; People's Choice, Ray Anderson, 1964 Chevrolet El Camino; Family Promise Choice, Marc Strauss, 1964 Ford Galaxie 500; and Unity Bank Choice, Chuck Dahms, 1991 General 6 x 6 5 Ton. Unity Bank recently raised a record $8,500 for Family Promise of Hunterdon County and Family Promise of Warren County, through their 12th Annual Cruisin' Bob's Classic Car Show. 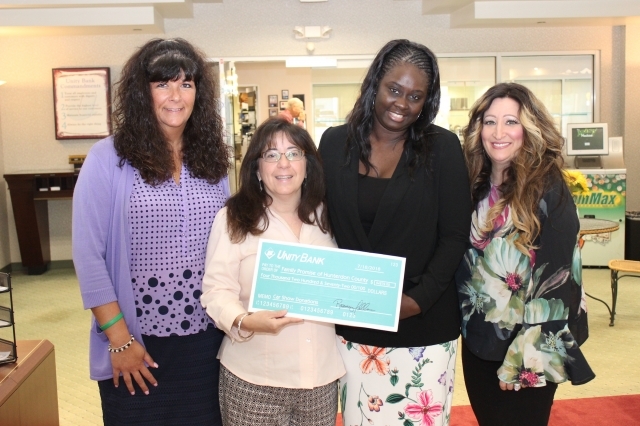 Pictured (from left) during a check presentation are Linda Vail, Unity Bank Clinton Assistant Relationship Manager; Rosemary Fellner, Unity Bank Chief Marketing Officer; Angela Fields, Family Promise Executive Director; and Amy Conover, Unity Bank Clinton Relationship Manager. Unity Bank recently raised a record $8,500 for Family Promise of Hunterdon County and Family Promise of Warren County, through their 12th Annual Cruisin' Bob's Classic Car Show. Pictured (from left) during a check presentation are Rachel Buxbaum, Unity Bank Marketing Coordinator; Crystal Rose, Unity Bank Marketing Officer; Maggie Koonz, Family Promise Housing Stability Case Manager; Tracy Tortorello, Unity Bank Relationship Manager; Colleen Baylor, Family Promise Program Director; Bob Frankenfield, Family Promise Executive Director; and Rachel Opdyke, Family Promise Housing Stability Case Manager.